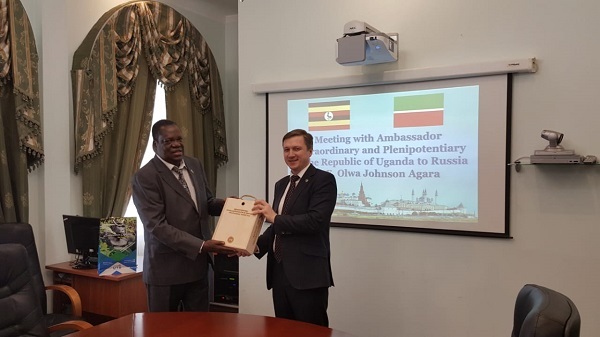 The two day visit was organised by the Ministry of Industry and Trade of the Republic of Tatarstan at the request of the Embassy of Uganda in Moscow . The issues discussed were of mutual interest in the areas of Trade, Investment , Education, Culture and tourism cooperation. The Ambassador also had meetings with the Investment Development Agency of Tatarstan, met the Mayorality of Kazan , visited the Kremlin of Kazan , met officials of Technopark in the sphere of high technologies "IT Park", visited the city of Innopolis which is a new IT city ( 3 years old), visited the university of Innopolis and the Federal University of Kazan. All the institutions visited were open to collabration, cooperation and to build partnerships with Uganda in the areas of Trade, Investment, Tourism, Culture and Education . The Embassy of Uganda in Moscow will follow up and the issues discussed and will work with the relevant stakeholders to ensure that the cooperation between Uganda and Tatarstan is strengthened further .